Henry ‘Money’ Miller, MLC (1809-88), financier and opportunist, who died leaving an estate of over £1.6 million, is said to have advanced £4,000 to merchant John Gomez De Silva to finance construction of his house Etloe Hall, in 1856; an amount so fabulous that the house is said to have been known as De Silva’s Folly. De Silva was a Portuguese merchant and importer who lived in Melbourne from 1851-59, the initial prosperous years of the Gold Rush and of Separation of Victoria from the colony of New South Wales. Even in this brief time, his business is said to have failed twice, leaving Etloe Hall undecorated. In 1853, the 12 acres (4.85 hectares) of Dalgety’s Paddock was subdivided and auctioned. Oberwyl was built on five of these allotments. Its designer is not known. Architectural historian, George Tibbits has suggested John Felix Mathews as architect of Oberwyl. He was certainly very prolific and 119 designs in Melbourne are known over 1852-73: both houses and commercial work. 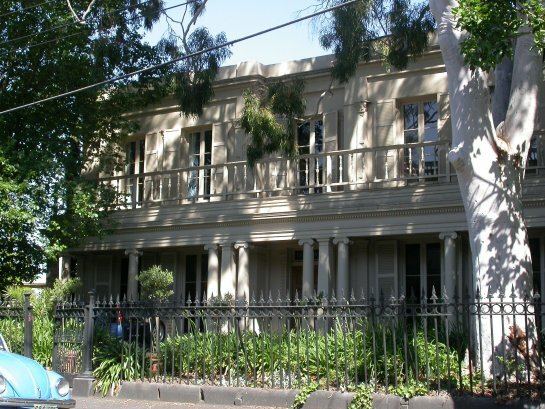 Etloe Hall’s severe Greco-Regency, neo-Classical manner although rare in Melbourne, does occur in other St Kilda houses of the mid-nineteenth century, such as Berkley Hall, 11 Princes Street (26) (1854) and 25 Chapel Street (1869). Perhaps the Regency gaiety of this style, derives from its seaside location, as Miles Lewis suggested. It could be said to have something in common with the architecture of Brighton and the spa towns in England. Two technical elements survive from this early period: fragments of an early canvas, or oil-cloth verandah-roof, (the only other example in Victoria is at Mill’s cottage, Port Fairy) and the corrugated pressed iron sheet fence with very wide corrugation pitch of 135mm, surviving from the 1850s. In 1856, Etloe Hall was a double-storied symmetrical house with four principal rooms on each floor, divided by a broad hall, the facade slightly recessed at the central entrance bay. The five bays each have French doors. The façade is decorated with Ionic pilaster-pairs, guilloche at ground floor openings, cornice-band and mould. It is a most refined architectural composition. Etloe Hall appears in the 1857 St Kilda Ratebook. In March 1857, the Argus reported the auction of De Silva’s newly erected 17-roomed house. By 1859, he had suffered sufficiently in business to have escaped from the colony and the house was resumed by Bank of Victoria. In 1858, Etloe Hall was leased by the bank to John Mackenzie, who retained it for almost twenty years. The next year, or 1861, Mackenzie added the ballroom, to the north-west corner, near Barkly Street. The Swiss art patron Madame Elise Pfund (1833-1921) established a highly regarded girls’ boarding school, at Oberwyl in 1867, which survived until 1931. The school was known for its elegance and French culture. 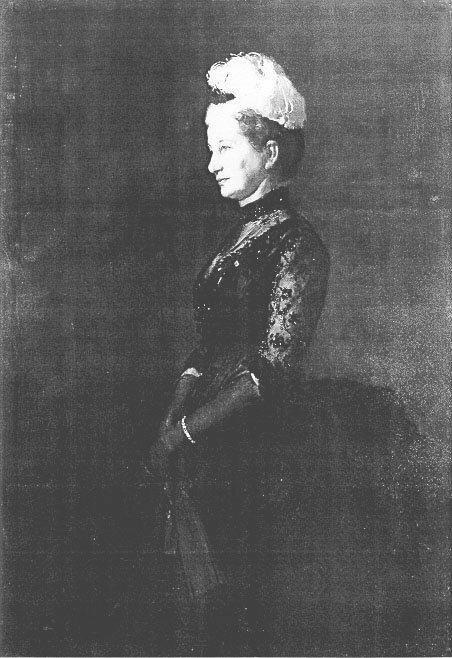 Madame Pfund was Elise Tschaggeny, who renamed Etloe Hall after her home village of Oberwyl in Switzerland. She married James Pfund, architect, then Surveyor General in the colony. In about 1887, a profile full-length portrait of Elise was painted by the great Australian painter, Tom Roberts, (my great uncle). It is one of the finest of the 250 portraits by Roberts and was purchased by the National Gallery of Victoria in 1948. 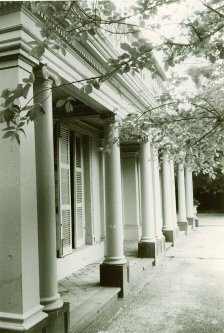 In 1878, the colonnaded verandah and two-storied south-east wing were added. In 1885 or 86, Oberwyl was purchased and Oberwyl Ladies’ College was run by Berthe Mouchette (c1850, France - c1920) and her sister Marie Lion, who arrived in Melbourne from France in 1881. Madame Mouchette was the widow of the Deputy Chancellor of the French Consulate. She was a significant artist who is said to have exhibited from 1878-81 at the Paris Salon. She kept two studios at different times, in Collins Street. Whilst the sisters were at Oberwyl, they enjoyed the powerful protection of Lady Loch, wife of the Victorian governor Sir Henry Loch (1827-1900, governor:1884-89). This was the period when the scale and grandeur of life at Government House in the Domain was at its height and governors had real influence in society. Their hospitality was on a very large scale and continued incessantly. Oberwyl and Mouchette’s school were vividly described by Oscar Comettant, in 1888. The sisters were founders of the Alliance Française (18) in Melbourne, which had its initial meetings at Oberwyl and continues to operate from St Kilda. They were also associated with the Melbourne Theosophical Society. The important Australian artist, Margaret Preston (née Margaret Rose McPherson, 1875-1963) is thought to have been a student at Oberwyl College, during the Berthe Mouchette period. Madame Mouchette’s paintings consisted mainly of flower studies. Her 1891 exhibition was dominated by a study of single magnolias and nasturtiums, and a branch of romnia, a most decorative Japanese flower. Paintings by a Miss Macpherson (sic) were included in an exhibition of work by Madame Mouchette’s pupils, c1890. In 1892, the sisters auctioned their picture collection and moved to Adelaide. They sold Oberwyl and the college to Miss Lucy Jones. Again, in 1898, Misses Garton and Henderson, who had established the school Kalimna in Acland Street, purchased Oberwyl. Misses Kathleen and Violet Dickens, grand-daughters of Charles Dickens were pupils. Oberwyl Ladies’ College was entirely private and fee-paying. It never received any government grants, unlike church-owned denominational schools (such as Acland Street Church of England School and Inkerman Street Presbyterian School) and government-owned schools (such as Brighton Road, (34) and Punt Road). Other private girls’ schools operated at The Priory (28) and Wattle House, (23). Hofwyl House Academy was built two years before Oberwyl College was established. It was a school for boys, further south along Barkly Street (44). The curious similarity in the names has not yet been explained; no connection between the two schools has yet been identified. 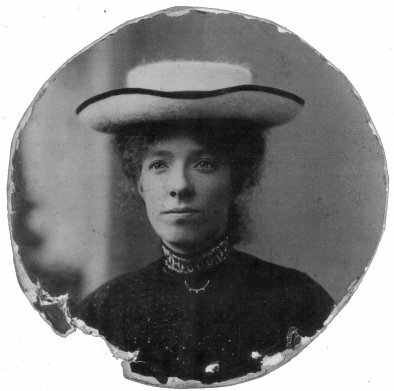 Garton and Henderson owned Oberwyl and its Ladies’ College until1910, when Miss Henderson left their partnership and bought the Fairelight Ladies College, which she developed into the eminent girls’ school, Clyde. For some years, the St Kilda Conservatorium of Music also occupied part of Oberwyl, with the girls’ school Cranleigh. Finally, after 45 years, the school closed in 1930. From 1910, Miss Garton remained living at Oberwyl and from 1935; it became the home of five Garton sisters: Katherine, Adelaide, Mary, Anetta, and Florence, with their great-nephew John Arrowsmith Bromley. 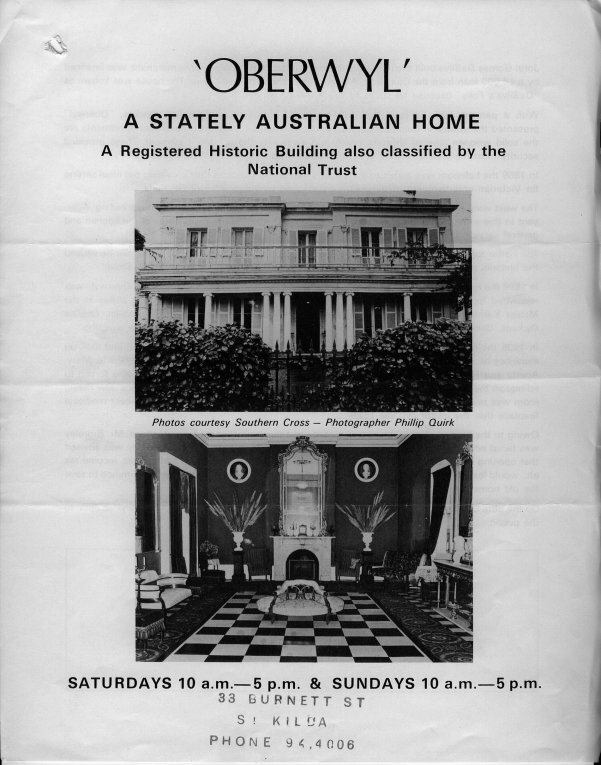 By 1967 Oberwyl was still owned by the Garton family and in 1974, Mr Bromley was still living there, in a rather eccentric lifestyle and occasionally opening Oberwyl to the public, rather as if it was an English Country House. Having been in the Garton family for almost 100 years, Oberwyl was sold in 1996: ‘brilliantly restored into a spacious family home’. Oberwyl’s history is victim to discrepancy and tangled skeins. It seems to have been confused by researchers with Eden Hall, which may have been its twin at the Barkly and Princes Streets junction. Michael Clarke, in his biography of his ancestor, Sir William Clarke of Rupertswood, says it was he who advanced the initial £4,000, but for Eden Hall. It is even possible that De Silva built both houses. The mystery remains. Note: There are no general histories or comparative studies of private schools in Victoria. ‘Berthe Mouchette’. (Unidentified source, National Trust File). p48. Butler, Roger. The Prints of Margaret Preston. A Catalogue Raisonné. Australian National Gallery. Oxford University Press. Melbourne 1937. p1. Clarke, Michael. Clarke of Rupertswood. 1874-1897. Melbourne 1995. pp 41 & 42. Croggan, Alison. ‘In the Grand Manor’. Emerald Hill Press. April 20, 1986. p21. Lewis, Miles. (Architects Index). Architectural Survey. Final Report. University of Melbourne. Melbourne 1977. p67. Lewis, Miles. Melbourne Mansions. (Database). Lewis, Miles. Physical Investigation of a Building. Technical Bulletin. 9.1. National Trust of Australia (Victoria). Melbourne 1989. p49. McCaughey, Davis, Perkins, Naomi, Trumble, Angus. Victoria’s Colonial Governors. Melbourne University Press at the Miegunyah Press. Melbourne 1993. pp243-282. McQueen Humphrey. Tom Roberts. Macmillan. Sydney 1996. National Trust of Australia (Victoria). File No.232. Nigel Lewis and Associates. St Kilda Conservation Study. Area One. 1982. p92. Peterson, Richard. Fences & Gates c1840-1925. Technical Bulletin. 8.1. National Trust of Australia (Victoria) Melbourne 1988. p56. Pike, Douglas, Ed. Australian Dictionary of Biography. 1851-1890. Vol. 5. Melbourne University Press. Melbourne 1974. Radford, Ron (Ed.). Tom Roberts. Art Gallery of South Australia. Adelaide 1996. pp 151 & 154. Sands and McDougall Directories. 1874, 1876 & 1879. Sheenan, Margaret. Berthe Mouchette. A Biography. Staughton Peter S., Chairman, Survey & Identification Committee. National Trust of Australia (Victoria). Letter, 9 October 1967. The Argus. 28 March 1857. Victorian Heritage Register. File No.H214.